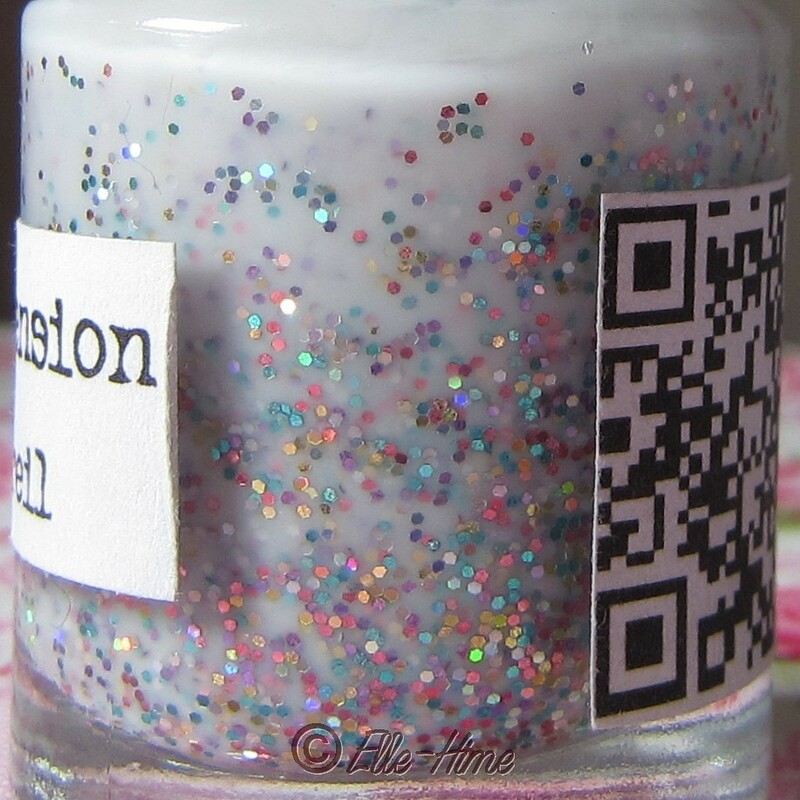 Princessly Polished: Different Dimension - Pastel Nonpareil: Custom Polish! 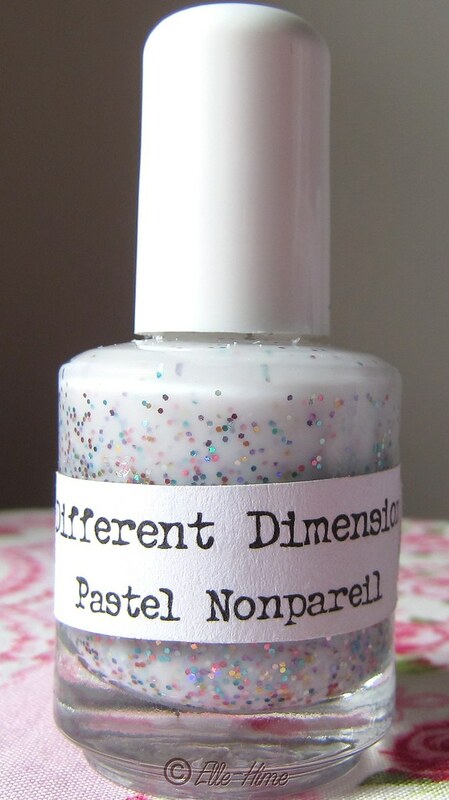 Different Dimension - Pastel Nonpareil: Custom Polish! This is an extra-special review post, because I'm getting to share my very own custom polish creation from Different Dimension on Etsy! After seeing a similar polish in her shop I was inspired to request my own tweaked version called Pastel Nonpareil. Isn't it lovely? My inspiration for the name was taken from these amazingly tasty and especially eye-catching treats served at our belated wedding reception. They were made by my sister-in-law! Didn't she do a stunning job? Let me tell you, these did not last long at all. Everyone loved them! 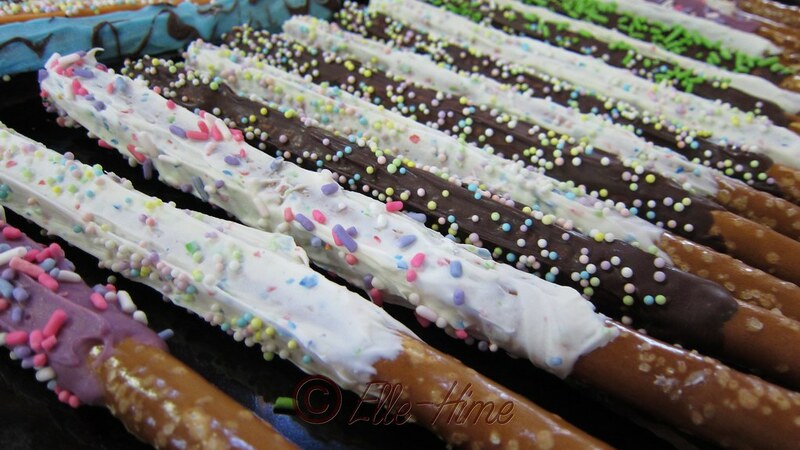 Nonpareil (non-puh-rell) sprinkles are my favorite sprinkles ever, too! Put them on something and I'll want to eat it. Thus the name behind my polish! So, let's get down to the nitty-gritty on custom polishes from Different Dimension. First off, sizing and price. A custom polish from Different Dimension is going to be in a full size Different Dimension bottle which holds 15ml. The cost for calling all the shots on your own Big-3 Free blend is $10, which I'd say is a smoking deal considering the quality Missi is known for and the fact that every custom polish comes with a personalized gift. Admittedly, I had it pretty easy in describing my request. "Like what you made there, but with X color added and no shimmer." Still, the customer service was great. My questions were answered and I had some options to work with before I fully made up my mind. I gave the polish a name and Missi had it finished for me in no time at all. Here you can see it has a printed label, finished the same way that one of Different Dimension's regular polish offerings would be. Oh, and that free gift? It's a handmade necklace of your polish that arrives in a little drawstring bag. Missi takes a bit of your custom blend and pours it into a cute glass vial, corks it and puts it on a long chain. (My chain was 24", it can be cut down easily if a shorter length is desired.) The cork is sealed into the bottle with a very strong clear glue. I don't know if the polish will ever dry out inside the bottle but I doubt it would change the look much if it did. Isn't it adorable? The bottle measures 1 inch including the cork, so it makes a nice piece for layering. I can definitely see wearing a couple of these necklaces together. I was very happy to open my package from Different Dimension and be able to wear my custom polish right away - no dry time! One other thing to note is the value of the necklace. 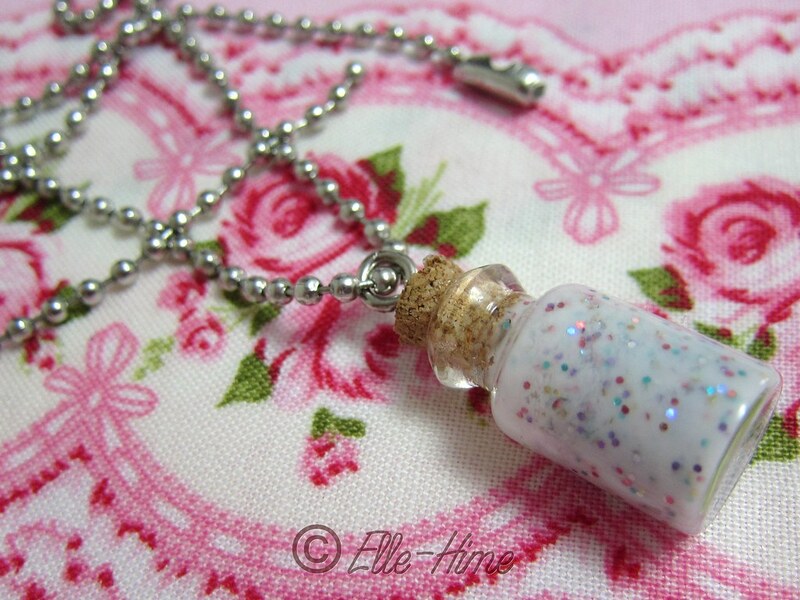 You can buy a vial necklace filled with one of the colors regularly offered in the Different Dimension store. It's essentially the same thing, and the cost is $5.00. So if you figure that you just spent $10 for a 15ml nail polish made just for you and that polish included a free gift valued at $5.00... I don't need to point out how good of a deal that is, do I? Pastel Nonpareil is a white jelly polish filled with small holographic glitters in a mix of rainbow colors. As you can see in the above macro shot there is a lot of glitter! It mixes easily and the somewhat thick formula is easy to work with just like all the other Different Dimension polishes I used beforehand. I almost used a white creme polish as a base, but I'm so glad I didn't. Above, three coats is squishy white jelly perfection. Top coat smoothed everything out, but I've also worn this polish without a top coat and the glitters aren't annoying or snaggy. You can see a hint of my nail line in this picture, but I hardly noticed it with my non-macro eyeballs. What surprised me is how much I loved it at one coat. I'm not generally into sheer polishes, but Pastel Nonpareil won me over. The white jelly base is what makes it work, evening out perfectly and making my nails look like they must be lovely on their own, not slightly stained from all the dark polish I wear... Oh, and the glitter helps, of course. ;D I actually wore my manicure with 3 coats one one hand and 1 on the other, and the winner remains undecided. I'll wear it both ways! Pastel Nonpareil, French manicure style! I've also used this polish in layering for jelly sandwiches, and it was wonderful like that, too. I ended up with a very versatile polish! Which Pastel Nonpareil manicure is your favorite? In conclusion, I definitely recommend Different Dimension for custom polish creation. I already have a few more ideas cooked up and am excited to say that you will be seeing a polish named by me in the Different Dimension shop soon!